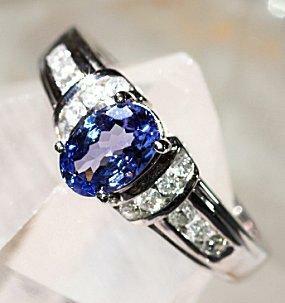 Sapphires are popular gemstones for many rings. Gemstone rings come in a wide range of colors, styles, and prices, making them attractive alternatives to traditional diamond engagement rings or anniversary rings. Before a couple chooses a different gem, however, they need to consider both the physical and emotional ramifications of that decision. Gemstone and other alternative rings come in a tremendous variety of styles that can match any bride-to-be's personality and preferences. Some designs mimic traditional diamond ring styles, while others are far more elaborate and unusual. Solitaires: Gemstone solitaires are one of the most difficult ring styles to find, since many people prefer additional accents and details to accentuate the colored gem. One option is for a couple to purchase a loose gem and have it set into a ring that initially held a diamond, or else to have the gemstone solitaire customized from the outset. Three Stone Rings: Three stone designs that symbolize the couple's past, present, and future are very popular with gemstones. Many times, the two smaller stones may be a different gem, even a traditional diamond, while the larger center stone is the gem of choice, or all three are complimentary or matching stones. Eternity Rings: Using gemstones instead of diamonds for a full eternity band is far more affordable, and colored stones can be arranged in symmetric patterns to highlight different hues for greater personalization. Birthstone Rings: Birthstone gems can be used to represent the bride and groom, significant dates in their relationship, and even the wedding date for a meaningful and colorful ring. Figural Rings: Colored gems are perfect for creating figural designs, such as using marquise, oval, and pear shapes in patterns to create leaves or flowers. Many gemstone rings also use colored gems as part of animal figures to highlight eyes or other distinctive traits. 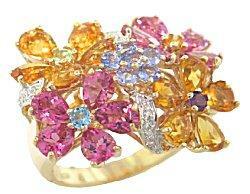 Right Hand Rings: Any creative ring design can be classified as a right hand ring, particularly if it uses gemstones. These styles may incorporate geometric elements, elaborate patterns, filigree details, or other gorgeous accents to create a ring totally unique to the wearer's personality. Rubies: The brilliant crimson of a ruby symbolizes both passion and love, making it an intimate expression of a couple's relationship. Emeralds: Rich, deep greens are mysterious and exotic, as well as symbolizing fertility and wealth, both characteristics that may serve a marriage well. Sapphires: From light blue to dark navy, sapphires are sophisticated and elegant gems that work well for engagement or other gemstone rings. Pearls: A traditional gem for brides, pearls are simple yet elegant and come in a variety of hues to suit different fashion trends and tastes. While these four gems make up the majority of gemstone rings, seasonal variations for different birthstones can be found relatively easily, and many jewelers are beginning to carry a larger selection of other popular gems such as aquamarine, topaz, pink tourmaline, and tanzanite. While gemstone bands and rings are not historically or traditionally thought of as engagement rings, there is no reason why a couple cannot choose a stunning gemstone instead of a diamond to represent their commitment to one another. In fact, for many couples, a gemstone is a cheaper option than diamonds, and smaller, lower-quality diamonds can still be used as accents to the larger colored gem. Couples should be aware that each type of gem has different characteristics and should be judged according to its own perfection. Before purchasing a gemstone ring, examine its basic qualities: color, carat weight, cut, clarity, and flaws. Knowing what makes each specific gem valuable will help the couple invest in a quality piece rather than simply taking a good deal. Furthermore, it is far easier to synthesize artificial gems than diamonds, and couples should investigate the jeweler's reputation and warranty system to protect their investment and ensure they are not inadvertently purchasing a fake stone. One precaution every couple should take when choosing gemstones over diamonds is the sentimental attachment to society's traditions. A girl may initially want something different, but later realize that many friends and family members don't recognize the ring for an engagement ring at first because it isn't a diamond. Furthermore, some indiscreet individuals may question the couple's commitment because the ring is not a diamond (and therefore they assume it is less expensive or less treasured). While these considerations should not dissuade a couple from choosing the ring they prefer, they should be aware of potential misunderstandings. Whether for an engagement ring, anniversary gift, or just because, gemstone rings are beautiful pieces of jewelry that can enhance any sparkling collection. By knowing what types of gemstones are available and how to purchase a ring while still protecting the value of the investment, couples are sure to acquire not only a fine piece of jewelry, but also a gorgeous symbol of their relationship.